Why was Dave Kryskow known as a creepy player? (A) He liked to "poke check" a bit too much. (B) His idea of a "power play" involved duct tape and a rope. (C) When his team would "pull the goalie," he'd ask for the same treatment. (D) He was considered a "penalty killer," not because of his prowess when the team was shorthanded, but because of actual killings. (E) He spent a lot of time in the "referee's crease." 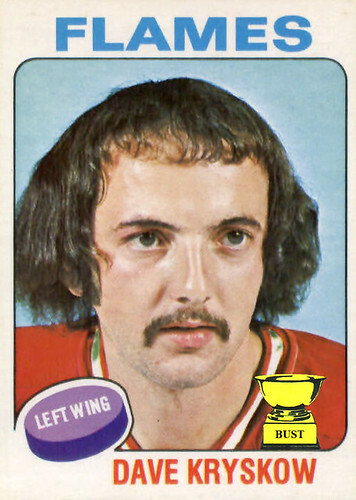 (F) He was an expert at the "slap shot": downing 3 ounces of Winner's Cup vodka and slapping the nearest person. (G) He dated a zamboni.